Restrained and ultra-modern, the slate jacquard weave of this Steel Brimble table linen drapes effortlessly and has a sense of low-key luxury. The unique and elegant look of this linen makes it ideal as the foundation or an addition for events of all types, whether you use them to highlight a wedding or a gala. With this and other similar linen designs, you can create an unforgettably appealing layout that will leave guests impressed. 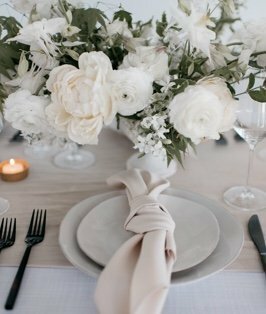 Combine this linen with others in the Everlast Kehoe Collection, a collection of our Designer Series, for a fresh event table design.